Ludwick Marishane is a young South African entrepreneur, who has built a successful business based on a product he developed that has received overwhelming international demand and catapulted him to world stardom. Marishane, his product and company have walked an interesting journey. The idea came when he was in high school and had a friend who hated bathing. In the Limpopo area on the northern-most part of South Africa, people use a bucket bathing method which makes them uncomfortable especially during the cold seasons, explaining their phobia for water. Seeing this would be Ludwick’s light bulb moment which would see him come up with DryBath®, a gel that does the work of a bath without the need for water. One applies the germ killing lotion and voila, they don’t need a bath. It is a product that would see him launch Headboy Industries Inc to commercialize it. It is touted as a life saver, especially at a time when over 2.5 billion people globally who do not have access to clean water. Ludwick talked to Fairplanet about the journey to coming up with the product, the milestones he has walked and what the future holds for the product. fairplanet: Tell us a bit about yourself. Ludwick Marishane: I am a 26 year old entrepreneur, founder and Managing director of Headboy Industries Inc. I am South Africa’s youngest patent-filer after having invented DryBath® at the age of 17. In 2011, i was rated as the best student entrepreneur in the world, and that same year, Google named me as one of the 12 brightest young minds in the world. I hold a Bachelor of Business Science, majoring in Finance & Accounting, from the University of Cape Town in South Africa. In December 2013, the global TIME Magazine named me as one of the 30 people, under 30, who are changing the world, one of only 2 Africans on the list. Forbes Africa named me as one of the Top 30 under 30 Young African Entrepreneurs in 2013 & 2015, and in 2015 I was chosen as one of South Africa’s 21 ICONS for the curation’s youth-focused 3rd edition. How did you come up with the idea of DryBath®? 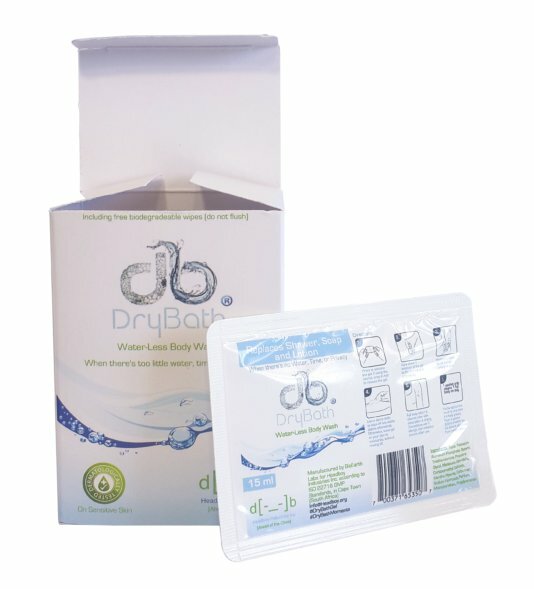 While at Dynamique High School,a small school northernmost part of South Africa with only 10 classrooms & no computer or science labs, I invented DryBath® in grade 11. The idea came to me after a lazy friend who hated to shower complained about why there wasn’t such a product on the market. In the Limpopo community i grew up in, most people used the bucket-bathing method where you boil water in a kettle and mix it with cold water in a small bowl in order to bathe. This method is very uncomfortable, and especially irritating during the winter months. I immediately started researching on Google using my modest Nokia 6234 cellphone to find out if such a product existed. To my surprise, no one had invented it. I spent six months reading Google and Wikipedia articles on lotions, gels and hand sanitizers, and i learned all about their different ingredients and how they were made. After i had finished learning, i started devising my own formulation in Matric. I paid about $6 to patent it, after having written the patent document myself. I even wrote my 40- page business plan on my cellphone because I didnt have a computer. After being accepted to UCT, i was fortunate to receive the Allan Gray Orbis Scholarship, which helped me build the networks necessary to gain traction during university. That is how DryBath was born and Headboy Industries inc came to existence. And what was the people’s reaction to the product? We had to spend a lot of time trying to understand what it meant for people "to feel clean". We spent years figuring out that people want hydrotherapy, clean clothes, quiet-time, and body odour-removal (which was identified as the biggest aspect of cleanliness). We were then able to refine the product development & marketing to position it as a water-less hygiene product that cleaned the body by removing body odour. How big is your reach? The product is sold in over 20 countries around the world, with 80 per cent of sales generating from the US & Europe. That is a big commercial success. Does DryBath® give you more than money? It solves a problem that I care about, and represents the birth of a profitable water-less hygiene category of products on the retail shelf. This category will be the light-bulb to an increasingly water-insecure society. If you were to do things differently, what would you change? I would've had a more mature team of advisors from an early-age, to guide me through the teething pains of being a young founder of a company with a global customer base. In your line of business, what would you consider your greatest milestone? Teaching investors & partners not to see us as a non-profit (we are a for-profit that sells a high social impact), but rather as a proxy for how future corporate structures can operate. We've also struggled to get implementation in our home country due to a poor innovation culture. You are a successful young entrepreneur. What does it take to be one? To be successful, you have to find joy in your continuing ability to pursue & achieve your goals, regardless of the ones you struggle with & what other people may think of them. Is there a connection between your project and water conservation? If so what is it? Our product saves 40-80 litres of water when people opt to use it instead of having a traditional shower/bath. We are also advocating for water conservation campaigns (at schools) to provide DryBath as their promotional gift, instead of shirts & caps that consume water to be cleaned and used. The product is more of a talking point, and the kids are more likely to start a discussion with their parents when they get home. School kids also tend to want to buy their own supply of the product after they try it (20-60% conversion), if it's affordable. The person I was 5 years ago, and the person I want to be in 5 years’ time. What next for Headboy Industries and Dry Bath? We have spent the past three years implementing a great university-student support program that, if we could scale without loss of efficacy, could double the number of students who graduate (and on time) in South Africa.